Centre of Information and Technology Management (CITM) has been established in the Institute with effect from September 01, 2011. 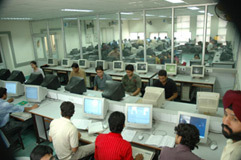 This has been established after integrating three units, namely, Computer Centre, Centre for Information Super-Highway and University Science Instrumentation Centre. This centre has been established to cater the needs of users involving implementation, maintenance and support activities related to software and hardware; procurement, support and maintenance of various equipments; and also providing the internet support to Thapar community. This centre also takes care of the implementation of ERP software and related support to the users of Thapar Institute of Engineering and Technology . CITM is also responsible for maintenance and administration of Thapar Institute of Engineering and Technology Website. The main objective of centre is to provide better support and services to the users for their individual as well as collective growth.